A major Symposium on Tissue Engineeering & Regenerative Medicine applied to daily clinical Dentistry will be held at the Catholic University Leuven (KUL) in Leuven, Belgium, on October 14-16th, 2016. 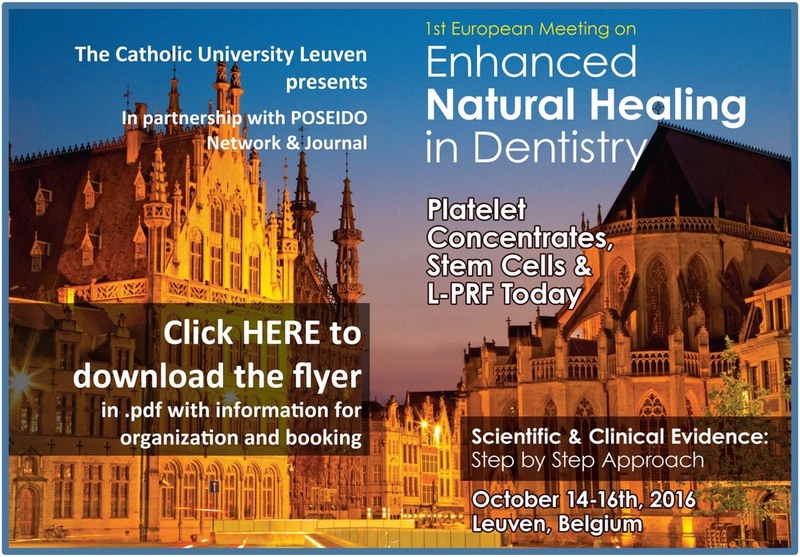 This 1rst European Meeting on Enhanced Natural Healing in Dentistry is the first global non-commercial and independent scientific meeting about the use of Platelet Concentrates, Stem Cells and more specifically L-PRF (Leucocyte- and Platelet-Rich Fibrin) organised worldwide.�These new strategies of regenerative medicine are impacting considerably our practice in periodontology, oral surgery and implant dentistry, but also in many other medical fields. To give adequate visibility to this major event, the Symposium will be held directly at the Catholic University Leuven (KUL), in one of the most prestigious Dental Schools worldwide and one historical & living Center of the European Implant Dentistry (rated in the top 5 best Dental Schools in the last QS World Ranking). This non-commercial Symposium is also strongly supported by the POSEIDO Network & Journal and the PACT (Platelet & Advanced Cell Therapies) Forum Civitatis of the POSEIDO�Community. All information for bookings and organisation can be found on the flyer in .pdf�(the flyer can be downloaded by clicking on the banner above).